The look in Oliver’s eyes was one of defeat. His skin was bright red, and he’d lost almost all his hair. 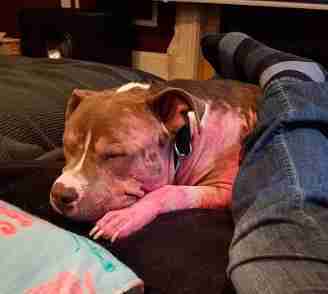 He had scratches and sores all over his body from desperately itching himself for relief. And now he was in a cage, shaking from fear and unsure of where he even was. 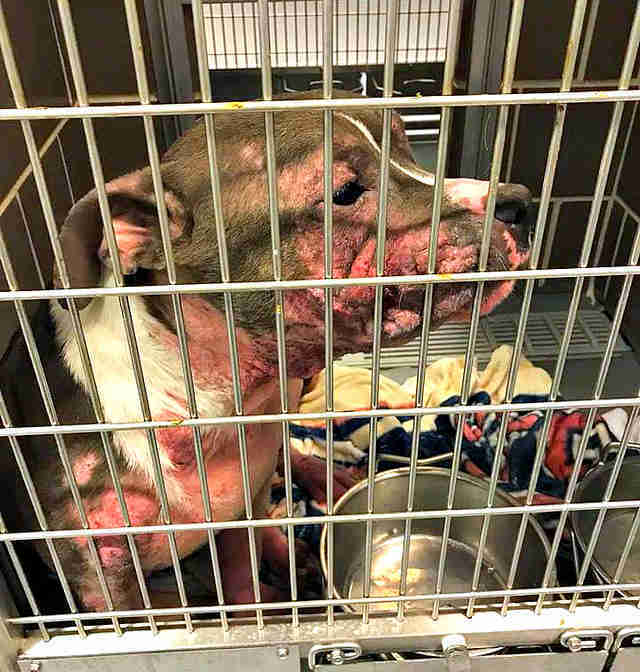 A Good Samaritan had just found him roaming the streets of Chicago and brought him to Chicago Animal Care and Control to get help. 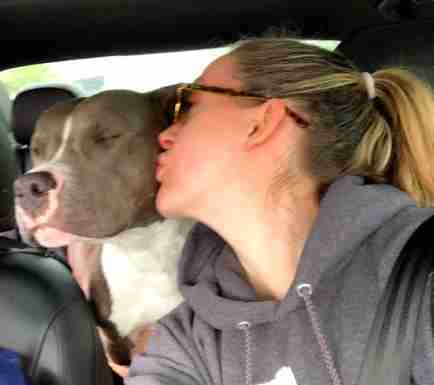 No one knew how long the 1-year-old dog had been out there — but it was clear no one had cared for him in a very long time. That’s when Lee connected with Tanner Smith, a shelter worker at Knox County Humane Society, to get Oliver out of the high-intake city shelter and into a loving foster home. Despite the pain Oliver was in, it was clear from the very beginning that all he wanted was to be loved. When shelter volunteers sat down on the ground with him, he started rolling all over them and his tail wouldn’t stop wagging. While Oliver’s past is unclear, Lee and Smith believe he definitely belonged to someone before ending up on the streets. 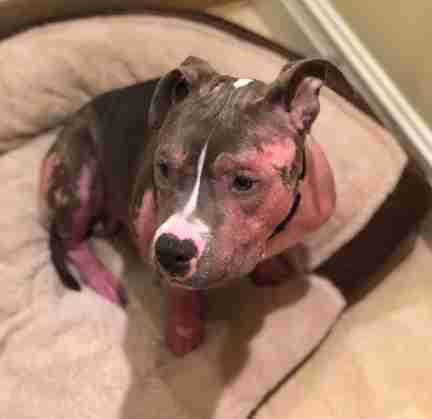 After a full vet check, Oliver was diagnosed with demodex mange as well as secondary skin infections. Lee and her husband, Johnny, set Oliver up with his very own room in their house and brought him to stay with them on April 4. 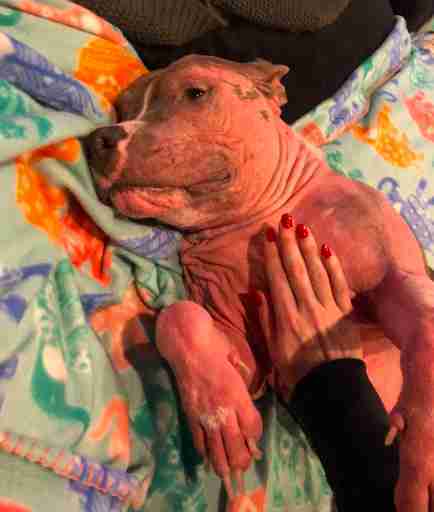 Lee gave Oliver gentle baths every day with a medicated shampoo to help clear his skin up, and also rubbed lotions and coconut oil on him afterward to soothe the irritation. 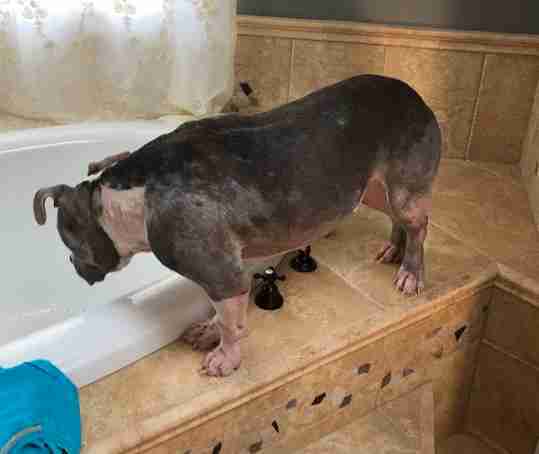 After about four weeks of daily baths, ointments and medication, Oliver finally made a breakthrough. His horribly irritated skin had begun clearing and he suddenly wasn’t spending his days in pain. As the days went on, Oliver kept getting better and better. He became obsessed with toys, and even started going on runs with Lee. He became excited about meeting new people and other dogs, too. 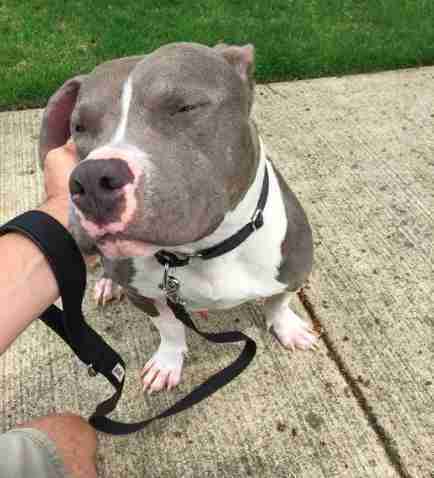 After six weeks with his foster parents, Oliver is finally mange-free and healthy. He’s now looking for the perfect family to spend his days with — a moment Lee and Smith are anxiously awaiting. 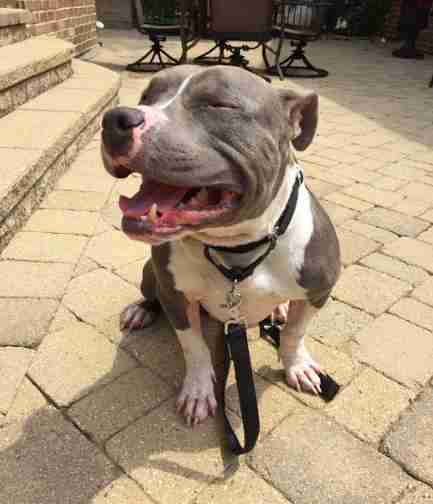 After seeing Oliver’s strong will to recover, they can’t wait for him to finally get the loving home he deserves. To help more pets in need, you can make a donation to Knox County Humane Society and Chicago Animal Care and Control. If you’re interested in adopting Oliver, you can find more information here.